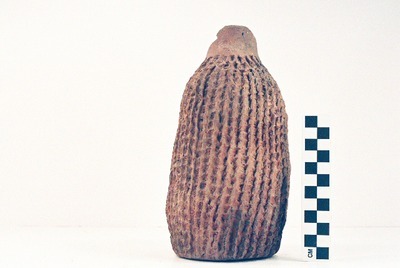 "41CE12-71" by Timothy K. Perttula and Robert Z. Selden Jr.
DECORATION (INCLUDING MOTIF AND ELEMENTS WHEN APPARENT): The vessel body is completely covered with vertical pinched ridges. Killough Pinched, var. Allen bottle from the Jim P. Allen site.